Breaking Beautiful has one of the most heartbreaking characters I’ve ever read and it has nothing to do with the accident that took her boyfriend’s life. Going in, I knew this story would be tough. To see the contrast between the life everyone thinks Allie has and the one she’s truly living is astonishing. To the world, Allie is the perfectly happy, spoiled girlfriend. Trip gives her everything she could possibly need, acts the part of loving boyfriend. Sure, she has some enemies in town because Trip dumped the popular girl in favor of Allie, but that’s a minor problem. What everyone doesn’t know is what happens behind the scenes, what Allie is too ashamed to face. Trip’s abuse has left Allie paranoid and broken. She doesn’t think of herself as worth anything because that’s what Trip beat into her. It’s all her fault and if she would only change, then everything could be perfect. That’s the mindset Allie has, even after the accident. She’s broken in nearly every way she can be. This book could have easily become depressing, but it didn’t. Even as you read about how hurt Allie is, her strength comes through. She is still going on with her life, trying to find a new way to live. She hides away at times, but that’s only because she doesn’t know how to be Allie; she doesn’t know if just being Allie is good enough. Blake. I loved Blake. He knew enough about Allie to try and find her whenever she’d lose herself to her own thoughts. He plays the tough, bad guy, but he’s got a couple soft spots. Both he and Allie have skeletons in their closets when they start their relationship, but they work together to make it work. Blake finds a way to give back to Allie the pieces of her life she needs and shows her it’s okay to let other pieces go. 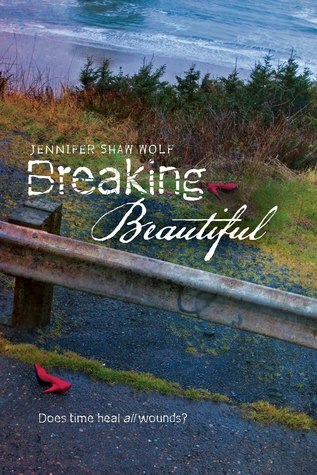 Breaking Beautiful is a heartbreaking story while being heartwarming at the same time. It shows that you can make it through the toughest times and come out stronger on the other side. It says that it’s okay to become lost sometimes; you can find a way out. I’m incredibly glad I decided to read Breaking Beautiful and it’s definitely a must read, if you ask me. This entry was posted in Contemporary, The Must Reads, Young (and New) Adult and tagged Contemporary, Jennifer Shaw Wolf, Must-Reads.